Introducing 3D Motion Analysis Technology from Gears. Built with the same measurement technology being used by rocket scientists at NASA and MIT, GEARS offers the most accurate golf swing tracking system on the planet. Gears gathers vital swing and club information and statistics using multiple high speed 3D motion cameras. GEARS distills that information to create a remarkably sophisticated three dimensional computer animated image of your swing viewable from every angle. GEARS also executes a multitude of calculations and measurements to develop a data driven personal club recommendation. Your fitter works with you inside the lab with our specialized equipment and takes you outside on the range to test your findings. Your custom golf clubs will fit better, improving your golf game and your score. At The Gears Performance Center, we provide the best of both worlds; allowing golfers to experience the most advanced club fitting technology while being able to go outside afterwards and hit balls on one of the best grass ranges in San Diego County. The only GEARS system available to the public for club fitting in San Diego. 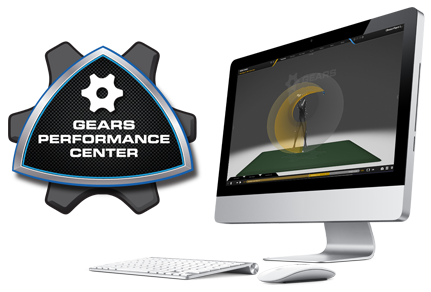 See how the GEARS PERFORMANCE CENTER can help your game!